I’m determined to bounce back from my previous loss so you can imagine my excitement when I saw this long-term forex breakdown on AUD/CAD. This could be my chance to catch a nice swing trade! 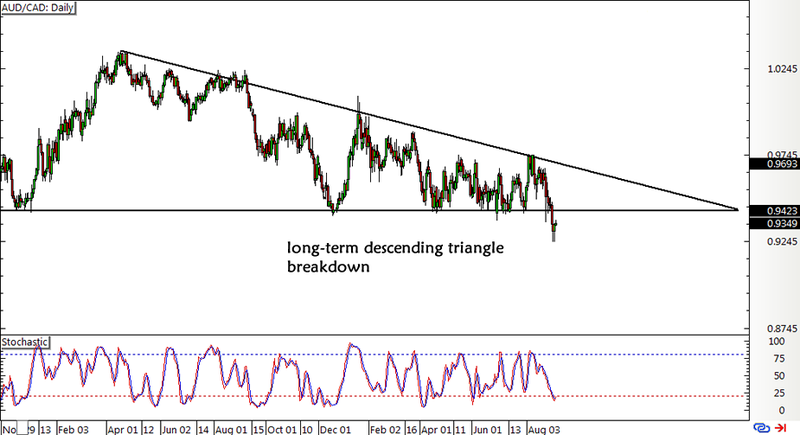 As you can see on the pair’s daily forex chart below, price already made a break below the descending triangle support. Now this chart pattern is approximately 900 pips tall so I’m thinking the resulting downtrend could last by the same number of pips. But since I already missed the actual breakout move, I’m considering waiting for a pullback instead. 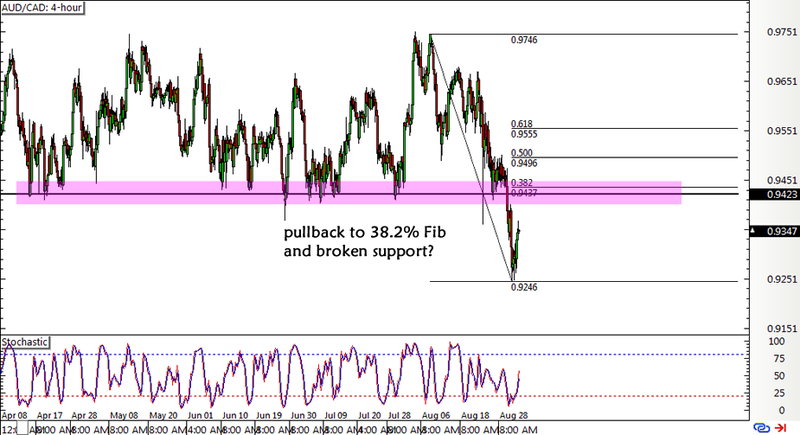 As Big Pippin shared in today’s Chart Art, the pair is showing a potential retracement play on its 4-hour time frame. The broken triangle support actually lines up with the 38.2% Fibonacci level, which might hold as resistance moving forward. While the technicals are looking pretty neat, I’m still 50-50 when it comes to fundamentals since both the Aussie and Loonie are looking weak. For one, the latest GDP release from Canada revealed that the country just slumped into recession due mostly to falling revenues from its energy sector. Meanwhile, the Australian economy could also face similar headwinds thanks to slowing demand from China. However, the Canadian dollar seems to be drawing a bit of support from the strong rebound in oil prices spurred by news that the OPEC is ready to talk with other producers, possibly to set a reasonable level for supply and prices. Signs of progress on this front could mean more gains for the oil-related Loonie, which might be enough to push AUD/CAD lower. I haven’t set any actual orders yet since I’ll be waiting for candlestick confirmation around my potential entry area. I’m also playing this carefully ahead of the Canadian jobs release on Friday… which reminds me, I gotta review Forex Gump’s Trading Guide for Canada’s July employment report!